Most homes have 5″ gutters. 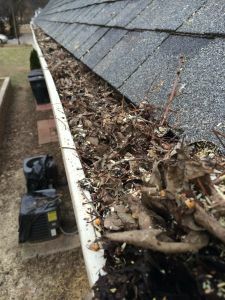 In some cases that’s adequate, but jumping to 6” gutters will vastly improve performance for an extra buck or two per foot. If the gutter contractor only sells 5″ gutters, he has no incentive to offer you the best solution. 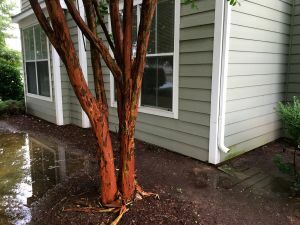 What’s more, many newer homes (up to 25 years old) with 5” gutters should never have had that size gutter installed because they were too small. This is especially true of larger homes that have steep and expansive roofs and homes that have gutters on multiple levels (2nd level drops to 1st level gutters). Six-inch gutters are beneficial because they handle 40% more water volume than 5” gutters. There are situations when 7” gutters are the best solution, but that is an exception rather than the rule for most homes. 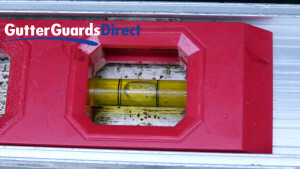 Do you use a level when installing gutters? Few gutter contractors use levels when installing gutters, which is the only way to know that your gutters are pitched properly, and is one of the chief reasons why homeowners experience water problems with their gutters. An incorrectly pitched gutter will guarantee problems due to water pooling inside and overflowing the gutters. 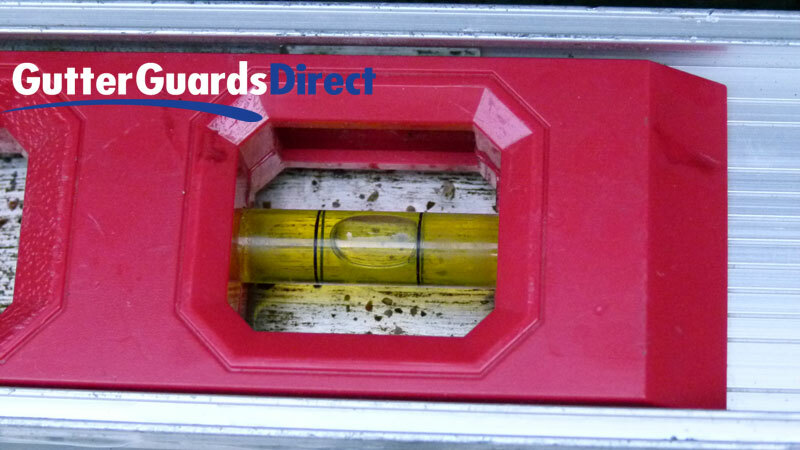 It only takes a few seconds to verify that gutters are pitched properly with a level, yet installers would rather perform a “water test” to make sure what flows the right direction or come back to “fix it” if it doesn’t work. You’ll want to phrase this question properly within the context of the conversation because a sales rep or contractor may tell you that they use levels when they don’t. 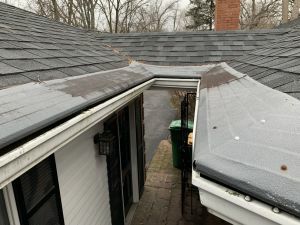 “What tools do you use to install gutters?” or “What do you think about using levels to make sure gutters are pitched properly?” may be all you need to understand the gutter contractor’s process and philosophy. 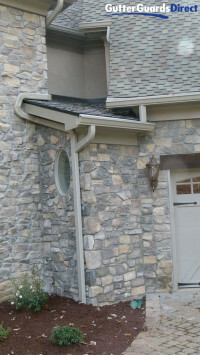 In this case, the downspout is to the left, so the right edge of the bubble should touch the right line or go slightly to the right of that line. Any more slope is unnecessary. Liability and worker’s compensation insurance policies are expensive with gutter and roofing contractors paying among the highest premiums. Hiring a gutter installer without proper insurance means that you could be liable for the injuries of a worker hurt while on your property. If this is a concern to you, simply ask the company to provide an insurance certificate showing that their insurance coverage is in effect. In some states, a single form will show all insurance coverages — liability, worker’s compensation, and auto — while other states will have separate forms for each type of insurance. A performance bond is less of an issue for homeowners, and is typically associated with large commercial and government work. It simply means that in the event of a default by the contractor, the value of the work will not be lost and the work would be completed as contracted. For example, a performance bond might kick-in when a homeowner pays a 50% deposit on a job and then the contractor does not perform the work. If the gutter contractor had performance bond insurance, the insurance company would cover the amount of the deposit paid or would ensure the work that had been started would be completed per the contract. How closely do you space gutter hangers? Hidden hangers are the brackets that hold gutters in place. They can be pricey, and there’s no mandate that says how closely hidden hangers should be spaced, so the fewer hangers used means that your gutter installer saves money and your gutters will not stand up well to water, snow, ice, wet leaves and other heavy debris. Don’t hire an installer who spaces hangers more than 24″ on average. How can you improve my gutters? Because installing gutters is a low-margin business, it’s a volume game, which means that most installers want to get in-and-out as quickly as possible. Ask prospective contractors what they would do to improve your gutter design and see what they say. This will tell you a lot about the their experience, attention to detail, and quality of work. The more twists and turns your roof has, the more opportunity for water problems on the roof, in the gutters, and around your foundation. These problems can lead to water damage inside your home, wood rot, and mold growth. 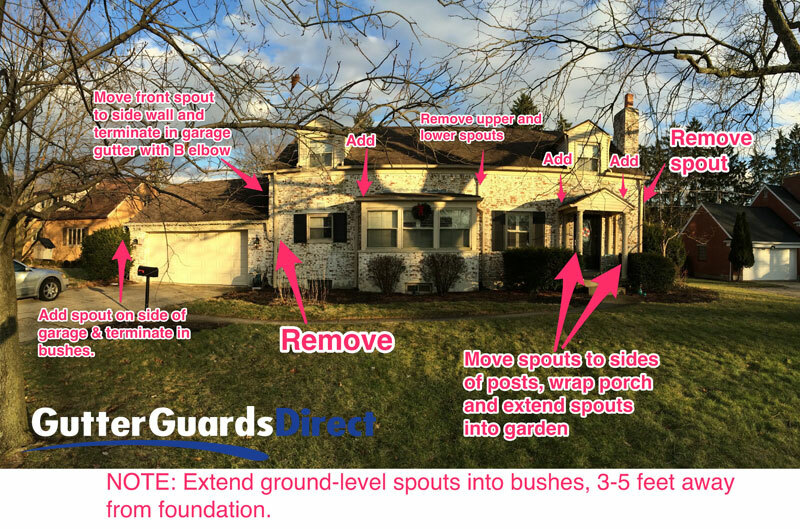 In addition to rerouting the downspouts, we upgraded this home from 5” to 6” gutters. Asking questions that are relevant to the work being performed will position you to hire the right contractor for the job, and will save you time, money, and headaches down the road. If you don’t like what you hear, be sure to get a second or third estimate/opinion until you find a contractor who has demonstrated an understanding of the situation and an ability to solve the problem. Question: What have you done to ensure that you hired the right gutter contractor for your job? Conversely, if you’ve had a bad experience with a contractor, what happened, did the contractor return to fix the problem(s), and what would you do differently next time? Share your comments below. What have you done to ensure that you hired the right contractor for your job? Conversely, if you’ve had a bad experience with a contractor, what happened, did the contractor return to fix the problem(s), and what would you do differently next time? To get the best gutter or gutter guard system as well as ensure your contractor is certified and insured check out the http://www.uam.ninja Snaplock and leaflock have changed everything about gutter and guard systems. 7 utility patents and home of the only no hole gutter attachment method. Reading post about gutter guards is always joyous to me. I really appreciate your hard work. https://www.homerudder.com/ is similar blog where people can find useful information.